The folks at Bide-a-Wee animal rescue in Manhattan have recently introduced the Kitty Play Date site, where online users can view and interact with kitties at the Bide-a-Wee facility. 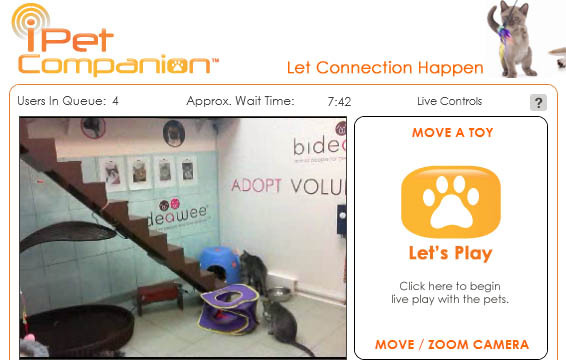 The kitty playroom is now equipped with a webcam and three mechanized toys from iPet Companion that users can activate from the comfort of their own homes. It should be noted that users are only allowed to play for two minutes at a time. There is usually a short queue of about 5-8 minutes, and, as is the nature of cats, there’s no guarantee they will take interest; however it’s still fun to see the kitties streaming in real time, even if they don’t want to play. You can also purchase these remote toys from iPet Companion and give your pet a similar set-up at home.